The printers said working with Al Held was difficult; he was temperamental. There were stories about mood swings and grumbling. He was one of those artists that would act out when things didn’t go right. Those who had worked with Al, widened their eyes slightly when they talked about him. It wasn’t exactly fear, but perhaps a well-established respect for his temperament. I started at Crown Point Press as an apprentice printer in 1985. I was in my early 20’s. It was my dream job - so when the printers gave warning, I vowed to steer clear of trouble. Kathan Brown; Owner and Director of the press would hold weekly meetings to outline the schedule. Held, she informed us was in the calendar, but time had been allocated prior to his arrival to do some research. He wanted to create a huge engraving. Fig. 5 Illustration of a burin incising a copper plate. Fig 4. Illustration of the correct grip on burin. Engravings are far more labor intensive than etchings. Etching has its historical roots in engraving, but engravings came first. In the 1400’s designs were manually carved, or engraved, into armor, using a hardened metal burin. It takes extraordinary skill to use a burin well. To engrave a delicate design or recognizable image into metal with an awkward angled knife requires a lifetime of practice. The discovery that one could fill engraved depressions with ink, and print the contained ink on to paper was of historical significance. When the printing revolution took the world by storm in the 1400’s engraving became the principle method for making and distributing highly detailed prints. Wood block and relief printing, as well as wooden type were all being established in Europe prior to the 1400’s. The famous Gutenberg Bible, printed with it’s revolutionary movable lead type, was published in 1455 - the first of it’s kind. Etchings began to replace labor-intensive engravings, around the 1500’s when metal smiths started to use acid to create incised designs on armor, and artists began using acid and copper plates to make etchings. In 1986 I simply could not imagine why Al Held wanted to make a huge engraving. It is common knowledge that hard ground etchings are easy to make and look similar to engravings. Engraving requires a Master Engraver with a lifetime of experience, and a large engraving would require a very large wallet. Al flew in from New York. He was not as tall as I had imagined, heavy in stature, mostly white whispy hair and sparkling light blue eyes. He had a New York accent and a warm smile. He was down to business right away. He and Kathan spent several days, interviewing local engravers. A strange cast of characters paraded through the studio, elderly men with spectacles wearing vests and funny hats. They were owners of jewelry shops who engraved wedding rings or gold watches for a living. Engravers charge by the hour. I can’t remember exactly what their rates were at that time but as I recall the calculations to create one 36 x 45” engraving was $70,000 - $100,000. Surely this was madness? There was a message in that madness that took me years to understand. We never made the engraving. The numbers were too astronomical. Even an artist with an international reputation such as Al’s could not warrant that kind of expense. But Kathan’s sincere search to try and find an engraver, her drive to do her best and fulfill Al’s request was the true lesson. Al and I hit it off. His mood did swing from time to time, he was emotional and not unlike my father. I felt like I understood him. I was prepared to do my best for him. 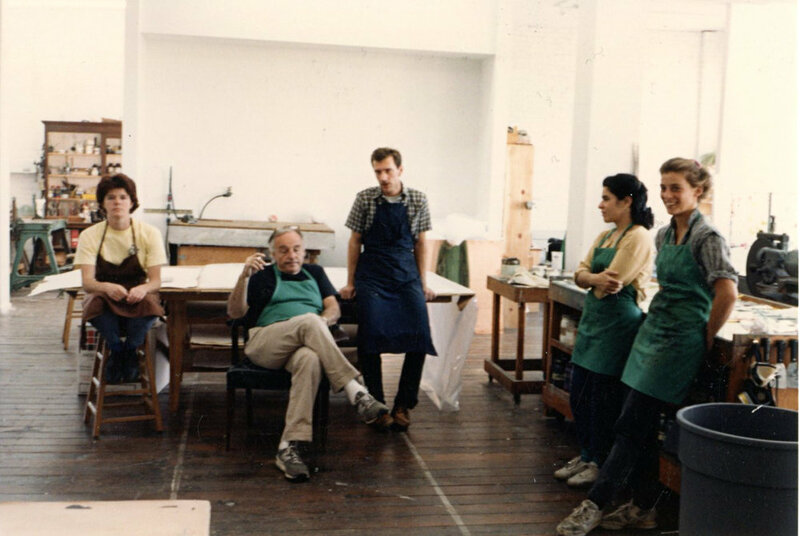 We worked together from 1986 to 1994 and created 12 large complex demanding prints. Kathan’s faith in her artists and her willingness to support the size and scope of these projects was an important lesson for me, and an important contribution to the fine print world. In lieu of the originally proposed engravings, Al created 4 large-scale hard ground etchings. It literally took years to create these beautifully crosshatched intricate images. Working through the mail and over the phone, Al would issue instructions and I and other printers spent hours fulfilling his orders. Al and I developed a great friendship over the years of working together. We had several stand-offs and his old temperamental self showed up. But I would stand strong and show him my conviction, and he always melted into a smile. McCarthy's work really began to stand out for me in 2011 after Jack Hanley moved to New York and started showing her weave paintings in his gallery there. Her extraordinary colorful weave paintings garnered a lot of attention. Everyone at Paulson Bott Press wanted to work with her, even though we knew it was going to be challenging to make a print as stunning and rich as her paintings. Often studio visits are very informative. We get to know an artist and see first hand how they approach working in their own studios. These observations are crucial in helping us work with them in the print studio. We made an appointment to visit her in downtown Oakland. At that time, her tiny studio was located in a battered old five-story brick building on the fourth floor. She shared her space with two other artists. When we visited, she was working on several 5' x 5' paintings that took up the whole space. I don’t know how she got them in and out of there. Every surface was covered. I had never seen more colored pencils in my life. She was hand coloring a painted wood panel while we discussed her upcoming print project. In the print studio, we continued the discussion about different printmaking methods we could use to create the feeling of a weave. For her paintings, she’ll start in the center; she’ll paint two vertical lines and then two horizontal lines. Working back and forth between vertical and horizontal, she slowly adds lines of vibrant color. She builds it like a basket, weaving out so that there is an actual physical weaving of the colors going under and over. To replicate that effect with a print, she made two plates, using sugar lift. She set the plates side by side and painted them with stripes, using the same brush and spacing the stripes equally: a stripe of sugar lift, a stripe of bare copper. Her working style required her to work vertically. Fortunately, we’d learned from working with Gary Simmons that we could take the copper plates and screw them directly to the wall. We couldn’t actually weave the stripes of color the way she made her paintings. So we printed the two plates at right angles to each other to create the weave effect. More recently, I’ve been working with her on public art. I helped her apply for the public art pool for the San Francisco Arts Commission. SFAC ended up in selecting her to make three proposals. We were thrilled when she was awarded the commission for Jet Blue at Boarding Area A in the San Francisco International Airport. She’s creating a large glass panel that will hang in front of the bay windows at the end of the walkway in the international terminal. There’s a lot of paperwork involved, and we are still trying to find a structural engineer to work with. There’s no existing structure in place to support the weight of her piece, so it’s going to be a huge challenge. She decided not to create a weave image for the airport piece, because the mullions for the existing bay-window already creates a grid. As she put it, “It’s going to be grid-crazy if I do a weave.” So she came up with a color burst idea, rays of color radiating out of three different points that overlap and come together to form a new color. It’s going to be beautiful. Alicia is fearless. She’s always juggling several things at once, creating installations for multiple venues as well as staying on top of her studio practice and teaching. She plays the banjo and guitar without ever having had lessons. She has no fear of climbing on scaffolding to paint a seven-story building. She’s a passionate, generous teacher at SFAI. She instructs her students to “Show up for yourself.” It is apparent she is speaking about herself and her art.